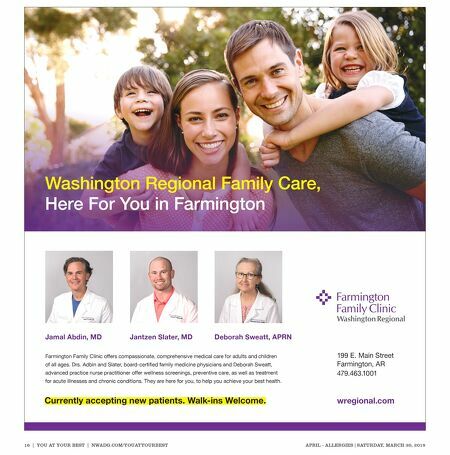 16 | YOU AT YOUR BEST | nwAdg.cOm/YOUATYOURBEST ApRil - AllERgiES | SATURdAY, mARch 30, 2019 199 E. Main Street Farmington, AR 479.463.1001 wregional.com Washington Regional Family Care, Here For You in Farmington Jantzen Slater, MD Deborah Sweatt, APRN Jamal Abdin, MD Farmington Family Clinic offers compassionate, comprehensive medical care for adults and children of all ages. Drs. Adbin and Slater, board-certified family medicine physicians and Deborah Sweatt, advanced practice nurse practitioner offer wellness screenings, preventive care, as well as treatment for acute illnesses and chronic conditions. They are here for you, to help you achieve your best health. Currently accepting new patients. Walk-ins Welcome.